You forgot to download Actual Bookmarks	. Click the link below to download it. Web browsers are not very comfortable when it comes to managing bookmarks. You may be able to move bookmarks from one place to another, but it is a different story if you wish to make sure their URLs are still valid or check for duplicates. This is where Actual Bookmarks comes in. The application works like a cleanup utility, but for your web browsers. It can find outdated URLs, dead bookmarks and duplicates and it allows you to solve these issues with only a few clicks. 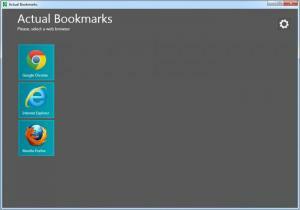 Actual Bookmarks is absolutely free and you can have it up and running in less than a minute. The application works on Windows XP and all later editions and it provides support for Internet Explorer, Mozilla Firefox, Google Chrome, Opera and Safari. When launched, Actual Bookmarks will automatically detect your installed web browsers and it will display them as large icons on a clean and simple user interface. All you have to do is select a browser and watch as the application scans its bookmarks. Scanning a browser's bookmarks is a three-step process. The application will look for URL errors, out of date or moved bookmarks and duplicates. The scan results are listed on the same window, along with options for removing or ignoring them. Their entries can be expanded, to reveal additional details or duplicate groups. Once you decide which bookmarks to keep and which ones to move, you only need to click a button and your selected actions will be executed. The software can clean bookmarks from all popular web browsers. It can look for dead bookmarks, outdated URLs and duplicates. The results are made easy to understand and you can decide which items to keep or remove with only a few clicks. There are no clear drawbacks to speak of. While using Actual Bookmarks, you will be able to bring order to your favorite browser's bookmarks with nothing more than a few clicks. You can download Actual Bookmarks free here.